Pond vegetation management is an ongoing problem to almost anyone who owns or manages a pond. Aquatic vegetation is a natural and needed part of your ponds landscape. Plants oxygenate to the water, provide habitat for aquatic organisms, and are used as a food source, among many other benefits. When plants become overpopulated, management is needed to improve pond health, enhance recreation, and improve the aesthetic value of the property. Most pond problems can be attributed to nutrients entering the pond, poor construction design, and shallow water caused by sedimentation. Plants typically thrive in shallow water less than three feet deep because light penetration to this depth is low. A pond with many shallow areas will tend to have more aquatic weed problems. Aquatic plant management may include chemicals, mechanical removal, or stocking vegetation foraging fish. The most important step in setting up a program for vegetation management is the proper identification of plant to be controlled. Then determine the timing, rate, and the means of treatment to be used for the most cost effective control. It is best to begin management in April and May when infestations and temperatures are at a manageable level. Water temperatures usually have to be a minimum of 60 degrees to apply chemicals, but waiting until mid summer increases the chance of oxygen depletion and pond turnover. When deciding on which method to use, do research to determine the best option for your situation and always follow product label. 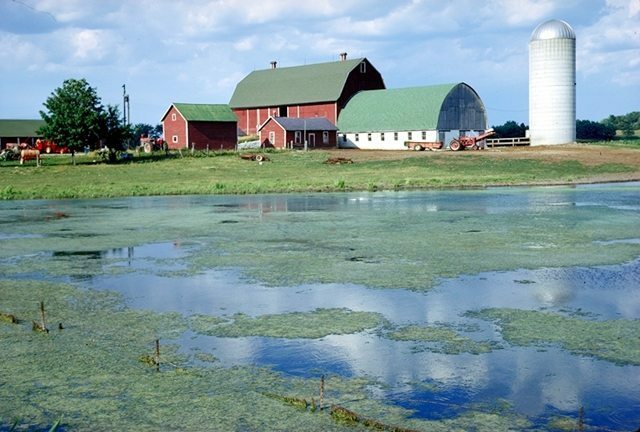 Our site provides many links to local problems and information regarding Ohio pond management. Multiple techniques may be needed for long term control. Whats that stuff in the water?